Palladium is one of six platinum-group metals, discovered by William Hyde Wollaston in 1802 as he attempted to process platina deposits into workable platinum metal. He named the new element after the also freshly discovered asteroid Pallas, and he initially made the strange decision to offer it for sale anonymously through distribution of an advertisement in 1803 but later disclosed his discovery officially in a scientific publication. Palladium is similar to other platinum group elements in that it is a silvery metal that is relatively non-reactive, but of the group it has the lowest melting point and is the least dense. In its applications it is most similar to platinum: useful in metallic form for the production of a variety of products and as a catalyst. Palladium catalyzes reactions involved in petroleum cracking, water treatment, nitric acid production, and polymer manufacturing, and is found in catalytic converters and fuel cells as a catalyst. Additionally, palladium is used to increase the rate of hydrogenation and dehydrogenation reactions, and serves many specialized catalytic functions in organic chemistry. In fact, the 2010 Nobel Prize in Chemistry was given for the development of palladium-catalysed reactions used in organic synthesis. As a metal, palladium is used in in electronics for plating of components, electrical contacts, and solder, and is also found in jewelry, watches, blood sugar test strips, and surgical instruments. Alloyed with silver, palladium is used as electrodes in the production of multilayer ceramic capacitors. Finally, a niche use of both platinum and palladium salts is in the production of fine-art black and white photographic prints with the platinotype process. Some other uses of palladium rely on chemistry unshared with platinum. Several of these involve useful interactions platinum has with hydrogen. As a gas, hydrogen easily diffuses through heated palladium, and thus palladium is used in the production of high purity hydrogen. Palladium also absorbs hydrogen gas, forming palladium hydride. This property is being researched for insights regarding hydrogen storage. Palladium chloride efficiently oxidizes carbon monoxide, and is used in detectors for the toxic but odorless gas. Additionally, radioactive palladium is under investigation for use in cancer treatment. Like other platinum group metals, palladium is typically obtained for commercial use as a byproduct from nickel and copper mining and processing, but can also be obtained from ores rich in platinum and from alluvial deposits. Along with ruthenium and rhodium, palladium is a decomposition product of uranium and could theoretically be recovered from spent nuclear fuel, but the problems inherent in working with radioactive materials make this an impractical source for the rare element. Palladium is frequently alloyed with gold, silver, iridium and other platinum group elements for use in jewelry. The metal is used in surgical instruments and electrical contacts. Palladium is also an excellent hydrogenation and dehydrogenation catalyst and is available in many organometallic forms for this purpose. Palladium is available as metal and compounds with purities from 99% to 99.999% (ACS grade to ultra-high purity). Elemental or metallic forms include pellets, rod, wire and granules for evaporation source material purposes. Palladium nanoparticles and nanopowders provide ultra-high surface area. Palladium oxide is available in powder and dense pellet form for such uses as optical coating and thin film applications. Oxides tend to be insoluble. Palladium fluoride is another insoluble palladium source for uses in which oxygen is undesirable such as metallurgy, chemical and physical vapor deposition and in some optical coatings. Palladium is also available in soluble forms including chlorides, nitrates and acetates. These compounds can be manufactured as solutions at specified stoichiometries. Palladium is a Block D, Group 10, Period 5 element. The number of electrons in each of palladium's shells is 2, 8, 18, 18 and its electron configuration is [Kr] 4d10. 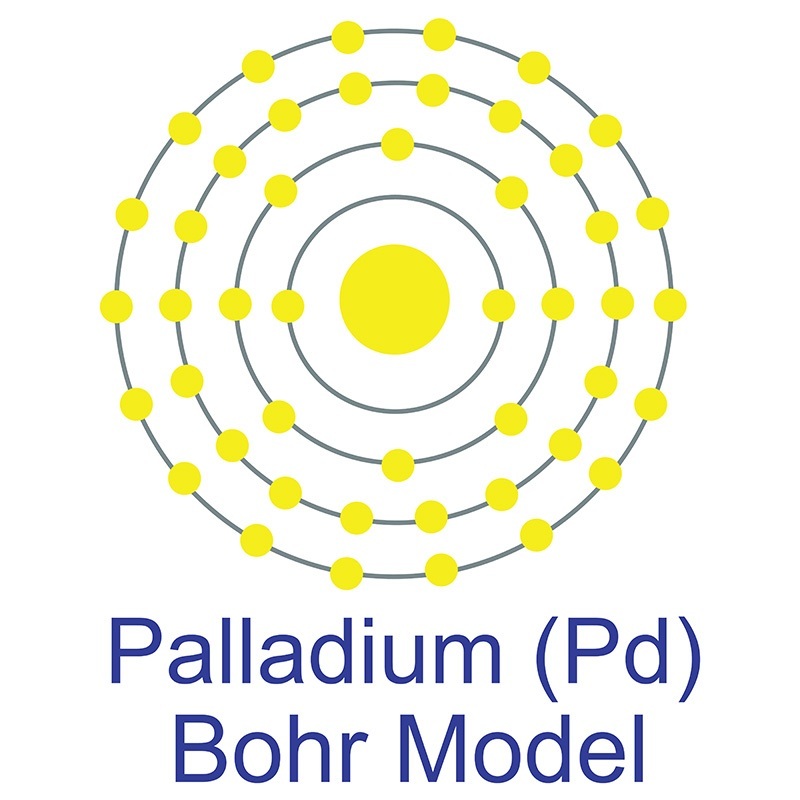 The palladium atom has a radius of 137.6.pm and its Van der Waals radius is 163.pm. In its elemental form, CAS 7440-05-3, palladium has a silvery white appearance. Palladium is a member of the platinum group of metals (along with platinum, rhodium, ruthenium, iridium and osmium). Palladium has the lowest melting point and is the least dense of the group. Palladium can occurs as a natural alloy with other platinum-group metals. Nickel-copper deposits are the main commercial source of palladium. Palladium was first discovered by William Hyde Wollaston in 1802. Safety data for Palladium and its compounds can vary widely depending on the form. For potential hazard information, toxicity, and road, sea and air transportation limitations, such as DOT Hazard Class, DOT Number, EU Number, NFPA Health rating and RTECS Class, please see the specific material or compound referenced in the Products tab. The below information applies to elemental (metallic) palladium. Naturally occurring palladium (Pd) has four stable isotopes: 104Pd, 105Pd, 106Pd, and 108Pd.